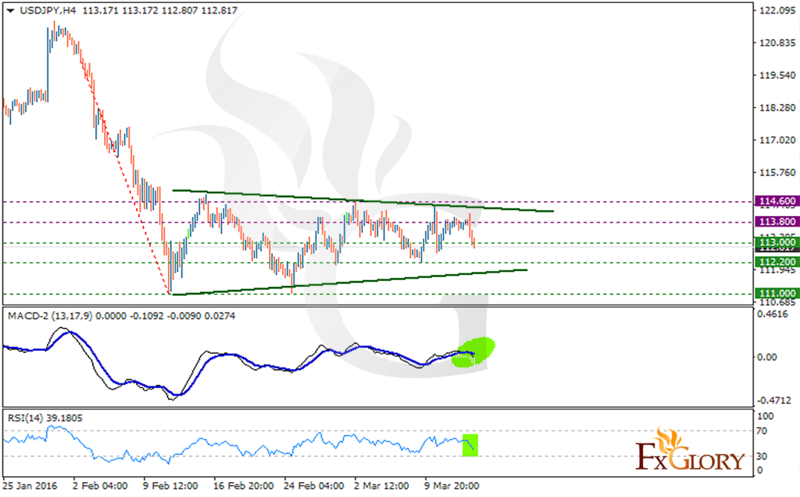 Today USDJPY is affected by several news factors from US and Japan. US is releasing the February’s retail sales report which is expected to grow. Moreover, the Empire State manufacturing along with NABH housing market index are about to publish their increasing rate. On the other hand, Japan will be announcing news regarding the BOJ Press Conference, Revised Industrial Production m/m and Tertiary Industry Activity m/m. Now the first support lies at 113.00, the next is at 112.20. The first resistance resides at 113.80, the next one is at 114.60. There is a bearish pennant pattern shaped already in H4 which just needed to break down to confirm bearish trend, but as far as it will not show itself, pair will move within the triangle.